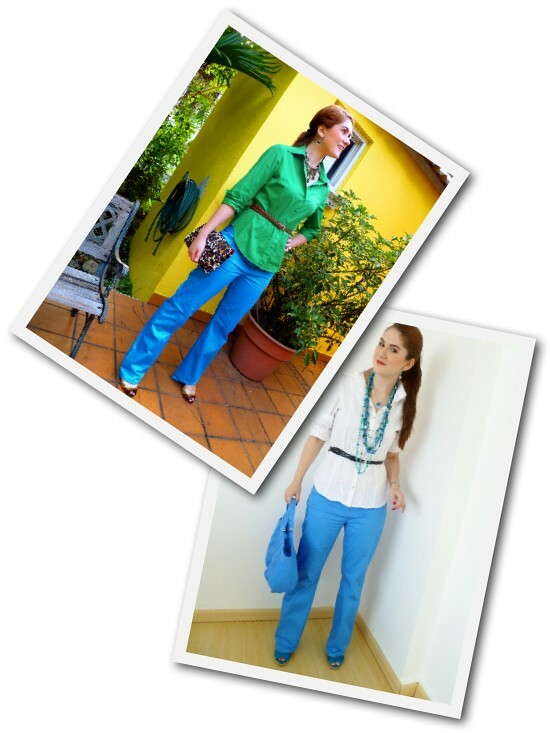 The Joy of Fashion: Just Blue! Today I decided to just go blue! I saw the below image a couple of weeks ago and thought it was such an easy chic idea that I decided to try it today! I'm also pretty happy today because I'm wearing a pretty special necklace. I couldn't decide whether to wear the flower charm my friends gave me or the star charm my boyfriend gave me. So what did I do? I wore both! I love that I have both my friends and my boyfriend near my heart. Now I just need a charm for my family! Oh, and of course I can't help but post yet ANOTHER cute kitty photo. 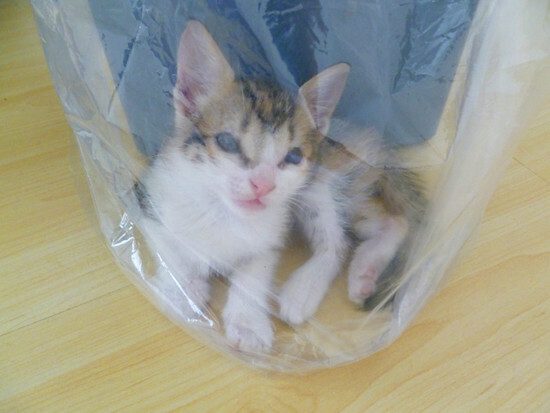 One of our new kittens is currently obsessed with plastic bags. He just loves hiding behind them! CUTE! You look GORGEOUS! Those pants, I die! I love seeing all the pictures of your precious kitties! And--wow! You sure do rock that bright blue! that blue is like an electric sky, sigh! :) your accessories have me drooling. Love this blue outfit! The necklaces are super pretty! 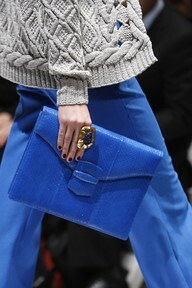 And this "narrow" belt is amazing, it makes the outfit very flattering! I have these pants ! and had been thinking about doing a monochromatic look - this looks great ! Siempre t ha quedado lindo ese color :D no se como haces para acordarte d donde salieron la mayoria de tus accesorios! Gracias por siempre pensar en tus amigos! Eres yna amiga demasiado valiosa y todos te queremos muuuuchooo!!!!!! :D me encanta tu conjunto! Se ve super fresco. Jeje el gatin sigue robando la camaras d sammyyy q comico q le guaten los cartuchos, como sigue d la vista?? Te quiero! What can I say? I love everything about this! 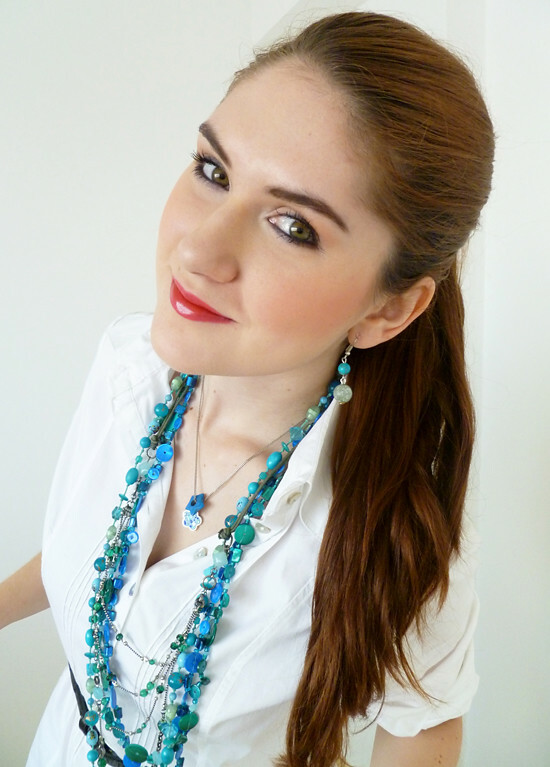 The blue is such a lovely color for spring and I love all the necklaces going on too! Dianin!! ERES LO MAXIMO! En verdad mil gracias por siempre dejarme unos comments tan lindos. Eres super buena amiga! Estoy tan feliz de que sepas de mi blog y que seas tan apoyedora en ella. En verdad muchas gracias. Hahaha, aqui estoy usando DOS collares que me dieron los donuts! En vd a veces me acuerdo de donde compro las cosas y a veces ni idea. Los gatitos estan bastante bien. Los doctores dicen que sus ojitos siempre se veran asi negritos, pero que el puede ver bastante bien a pesar de eso. Asi que todo super! te quiero!